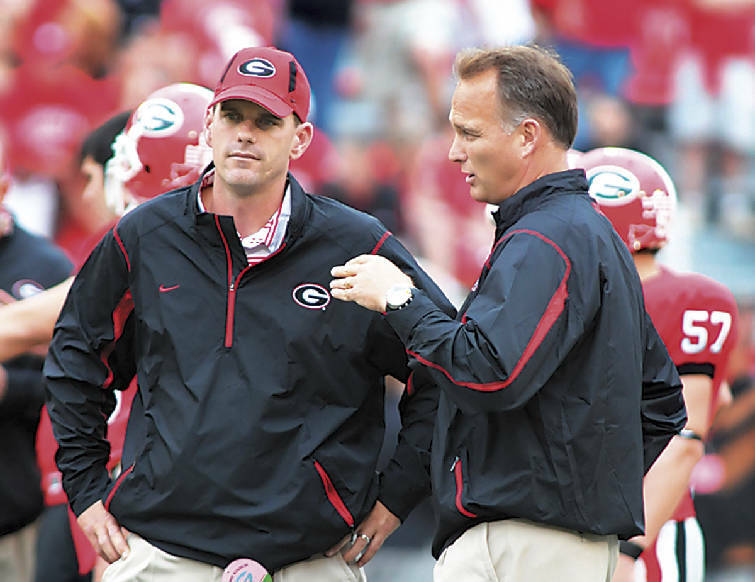 Since assuming play-calling duties from head coach Mark Richt late in the 2006 football season, Georgia offensive coordinator Mike Bobo has helped guide the Bulldogs to a 23-5 record. Of course, he's had some talent at his disposal. University of Georgia photo Offensive coordinator Mike Bobo, left, is 23-5 as Georgia's play-caller since taking over the role from head coach Mark Richt. All 23 victories occurred with Matthew Stafford at quarterback and Mohamed Massaquoi at receiver, and 21 of them were with Knowshon Moreno at tailback. Those recent fixtures now are gearing for next month's NFL draft, leaving Bobo with as big of a challenge as he's faced since joining Richt's inaugural staff in 2001. "We've got to keep being productive and keep getting better," Bobo said. "We're not looking to settle on anything because we lost three guys who were 75 or 80 percent of our productivity. We've recruited guys around here and have some good signees, and we're going to have to have guys step up. That's not only a challenge to me but all of our guys." The Bulldogs begin spring practice Tuesday and will hold their spring game, which will be televised by ESPN, on April 11. Georgia's offense returns A.J. Green, who led the Southeastern Conference last season with 963 receiving yards, and a much-awaited surplus of linemen, but the quarterback and tailback positions will have a different feel. New No. 1 quarterback Joe Cox played just once in Georgia's final 10 regular-season games last season, while new No. 1 tailback Caleb King had 2 yards on two carries during the final five games. Cox is the third fifth-year senior in five years to take over at quarterback. D.J. Shockley succeeded David Greene after the 2004 season and led Georgia to the '05 SEC title, but Joe Tereshinski succeeded Shockley and lost the job to Stafford midway through the '06 season. "It's always different when you put in a new guy underneath center," Cox said. "Everybody has to get used to each other, and that's our biggest goal this spring." Redshirt sophomore Logan Gray is second on the quarterback depth chart, followed by early enrollees Aaron Murray and Zach Mettenberger. Bobo is bracketing the freshmen at the third spot and expects to keep it that way through the 15 spring workouts. "My main focus for those two guys is to try and teach them as much as possible about our system and get them acclimated to how we do things and how I coach," he said. "Coming in the midyear is almost like a redshirt year for them. My plan is to let them learn and then come in about the same in the fall. Their heads are going to be spinning with everything we do, and there are going to be nerves and all that stuff." Bobo promises his head won't spin, even though this marks the first time in the Richt era that neither the top quarterback nor the top tailback started the season before. "The different feeling I've got is that I'm not satisfied with the way we played last year," he said. "Yeah, we had some productive numbers and stats, but that really doesn't mean anything. We lost three games and got blown out in two (Alabama and Florida) of them. We basically disappeared in some stretches of those games, and we lost to our archrival Georgia Tech in the last game. "I'm excited about the challenge of coming back from that. I'm going to coach the same way I've always coached."